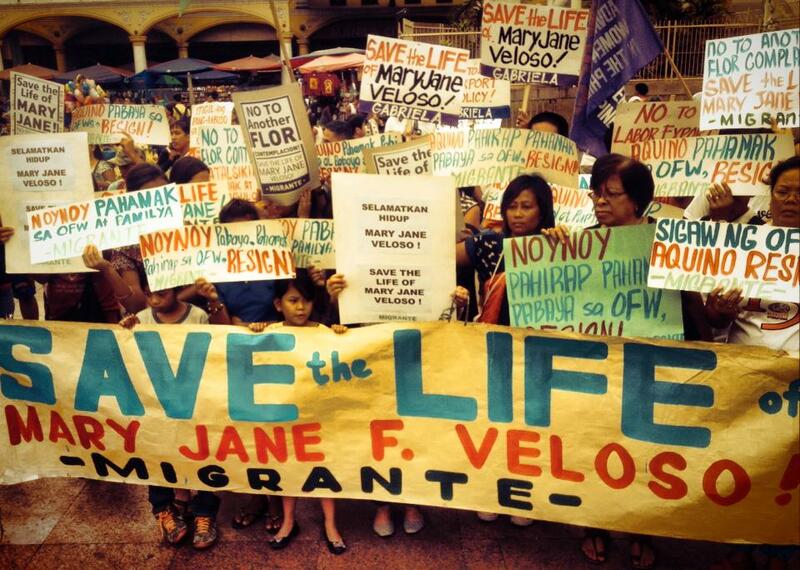 As calls to save the life of Mary Jane Veloso continue to gain steam nationwide and globally, public outrage against what has been established as the Aquino government doing “too little, too late” also continues to mount. Mary Jane was not only a victim of international drug syndicates, but more tragically of a neglectful Philippine government, according to global alliance of overseas Filipinos Migrante International. Like many others before her, Mary Jane was deprived of proper and sufficient legal assistance. Mary Jane was not provided a lawyer or translator by the Philippine embassy upon her arrest in 2010. During her trial, the court-provided interpreter was not a duly-licensed translator by the Association of Indonesian Translators. Her lawyer during the course of her trial was a public defender provided by the Indonesian police. It was only this year, when Mary Jane’s case was already up for a final judicial review, that the DFA appointed a private lawyer to represent Mary Jane, according to the Veloso family’s account. As a result, Mary Jane was convicted after a very brief trial period – on October 2010, just six months after she was arrested. Public prosecutors asked the court to sentence Mary Jane to life imprisonment but the judges handed down a death sentence. Migrante has long demanded an explanation from the Aquino government on why funds for legal assistance for OFWs in distress have been slashed since 2010, while presumably at least P52 million in legal funds for OFWs were unused since 2011. The DFA attributed the unused funds to a clause in the Migrant Workers Act stipulating a “ceiling” to the amount of assistance that is allowed per OFW in distress. “We find this justification deplorable and extremely irrational. On top of OFWs on death row, there are at least 7,000 OFWs in jail in the Middle East alone, some of them awaiting death sentences. The common occurrence is they get arrested and undergo investigation and trial without any representation or legal counsel from the embassy. Because of this, they are deprived of due process and go straight to jail without any legal assistance or intervention from the Philippine government. This had been the case for all seven Filipinos who were executed abroad under Aquino’s term,” said Garry Martinez, Migrante International chairperson. Should Mary Jane’s execution push through, she would be the eighth (8th) Filipino to have been executed on death row abroad under Aquino’s term, the biggest number under any presidential term in Philippine history. The Aquino government’s appeal for clemency for Mary Jane in 2011 was a passive and perfunctory effort, with no further attempts of such after the moratorium against executions was lifted by then newly-elected Indonesian president Joko Widodo. Pres. Benigno Aquino III only intervened more than a year after Veloso had already been sentenced to death, through a request for clemency with then-President Susilo Bambang Yudhyono who imposed a moratorium on executions during his term. This was later rejected by new President Joko Widodo who lifted the moratorium as soon as he took office. After which, there had been no active interventions on the part of Aquino to appeal for clemency for Mary Jane. “When Pres. Joko Widodo made his first state visit here on February 9, 2015, surely they had a chance to talk about Mary Jane. Aquino had all the opportunity to state Mary Jane’s case, or even at least give Mary Jane’s family a chance to personally air their appeal. It should have been an opportunity to stress that diplomatic relations will be strained should Indonesia decide to push through with Mary Jane’s execution. But obviously nothing even close to that took place,” Martinez said. For five years, the Department of Foreign Affairs and the Philippine government did not, even once, initiate contact with Veloso family, nor provide regular updates on the status of her case. According to Mary Jane’s parents, Cesar and Celia, and her sister, Maritess, they learned of Mary Jane’s imprisonment not from the government but from a phone call from Mary Jane herself, and a few days later from her alleged recruiter, Kristina Sergio. On May 13, 2015, Celia and Maritess went to Manila to seek the DFA’s help and received a promise from a DFA case officer that the agency will look into her case and provide assistance. After two years, the family finally gave up trying to get updates and decided to just save their transportation costs to send to Mary Jane instead. They were not given anything in writing, nor were they provided means to talk to or contact Mary Jane. “All efforts to contact Mary Jane were either at Mary Jane’s or the family’s expense,” Martinez said. In fact, the Veloso family’s first visit to Mary Jane on June 3, 2013 was made possible through the efforts of her fellow inmates and jail guards who contributed money for their air fare, passport and expenses for their one-month stay in Jakarta. The so-called confidential report, they said, they were allowed to only peek at just this year, when the DFA finally made the first move to contact them. “Veloso is a victim. She should not be executed. She was not only a victim of drug trafficking syndicates but also of government neglect.” Martinez called on all families of Filipinos on death row to “come out now”. He said that other OFWs on death row, such as Dondon Lanuza, Marilou Ranario and Cecilia Alcaraz, were granted clemency after appeals to save their lives garnered enough national and international support.